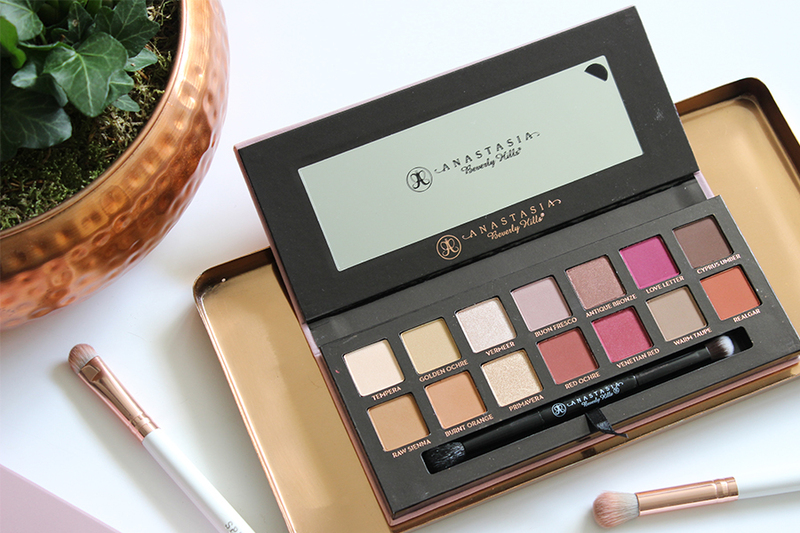 I've never been disappointed with any Anastasia Beverly Hills product and their latest release the Modern Renaissance Eye Shadow Palette is no exception. Possibly one of the most gorgeous eyeshadow palettes I own. Anastasia Beverly Hills very first permanent eyeshadow palette has met my neutral needs and then some. The new palette features 14 eyeshadows housed in a dusty pink velvety mirrored compact (similar to Urban Decay's original Naked palette). 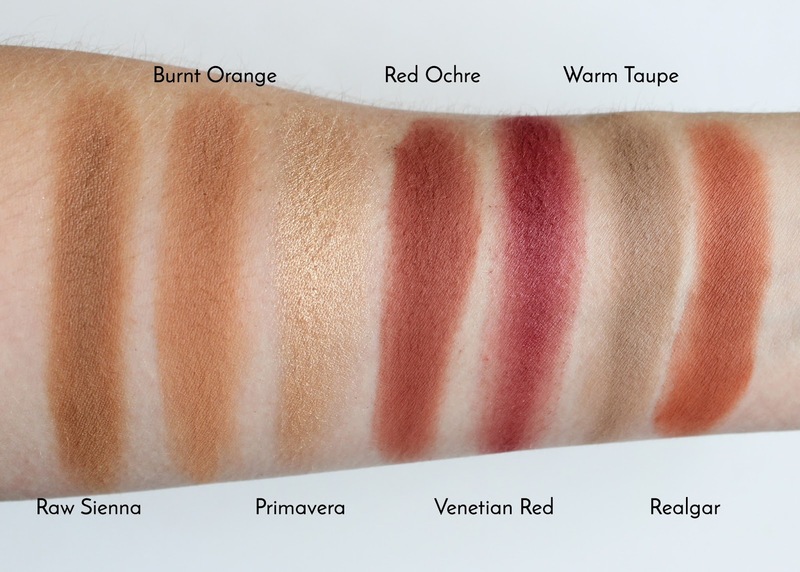 The shade assortment is comparable to the Violet Voss Holy Grail Palette and is filled with richly pigmented warm toned hues perfect for day and night and there's not a throwaway in the bunch. From earthy mattes, bold berry tones, burnt orange and a few standout pinks, they make for an ultra flattering mix. And if metallic eyeshadows aren't your thing, you'll be pleased to hear that Modern Renaissance Eye Shadow palette houses primarily matte eyeshadows with just 3 metallics available to dip into. The palette is accompanied by a soft dual ended bristle brush, which is a cut above the rest. And whilst I tend to reach for my Spectrum brushes, I wouldn't hesitate to make use of the ABH brush especially when travelling. The quality of these eyeshadows on a whole is very good and the formula is pretty consistent across the board (formula consistency is my biggest pet peeve when it comes to eyeshadow palettes). 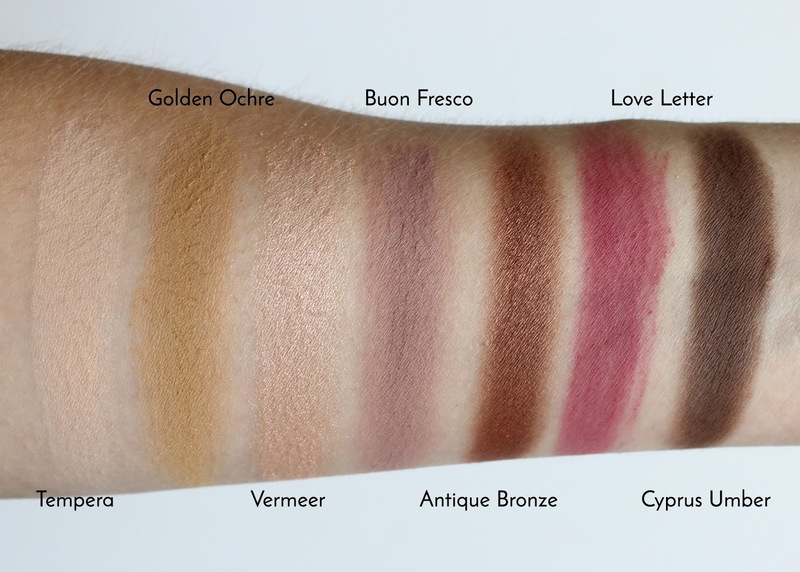 All the shadows are creamy and have a seriously rich colour payoff and build and blend effortlessly - so you don't need to be a master at blending! I was surprised to find these shadows apply well directly onto the lid without a primer and even without a primer boast a wear time of around 5 hours and 8 hours when worn with primer. It's simply a delight to use! This is now my second Anastasia Beverly Hills eyeshadow palette and whilst they are priced higher than most; I can vouch for the quality and say they are well worth the money. 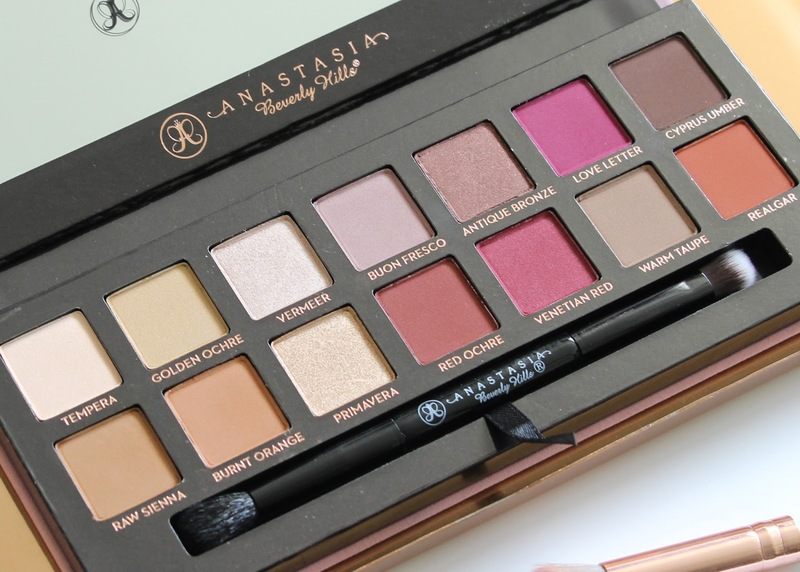 This palette is a must have for any eyeshadow lover, hoarder, collector and ABH devotee. I'm looking forward to seeing ABH release a permanent cool toned palette. But it's safe to say that for the time being my eyeshadow palette craving has been well satisfied. Tempera: a light beige with a satin sheen. Golden Ochre: a muted earth-toned matte yellow. Vermeer: iridescent shell pink with warm undertones and frosted finish. Buon Fresco: a matte muted medium lavendar. Antique Bronze: a dark brown with red undertones and a pearly finish. Love Letter: a dark raspberry with a matte finish. Cyprus Umber: a matte taupe brown. Raw Sienna: a neutral light-medium brown with golden undertones. Burnt Orange: a matte medium orange. Primavera: a shimmering medium gold. Red Ochre: muted red stone with a matte finish. Venetian Red: a medium matte dark red. Warm Taupe: earth-toned grey with warm undertones and a matte finish. Realgar: a brick orange with a demi-matte finish. The Modern Renaissance Eye Shadow Palette is available online here (£41.00). Have you purchase the ABH Modern Renaissance Eye Shadow Palette?